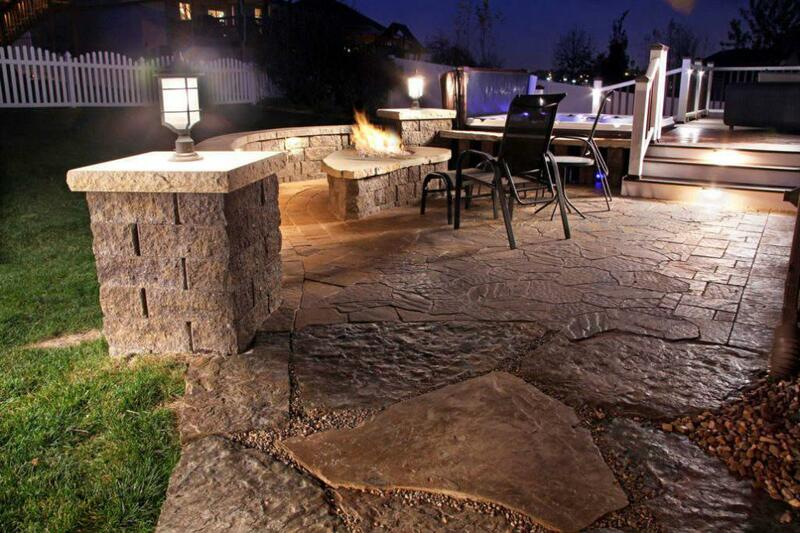 Your landscaping with stone and plants make your home stand out from the rest during the day, but what about at night? All of your beautiful landscape is swallowed by the dark. By adding external landscape lighting. you can add a whole new dimension to your existing landscape. 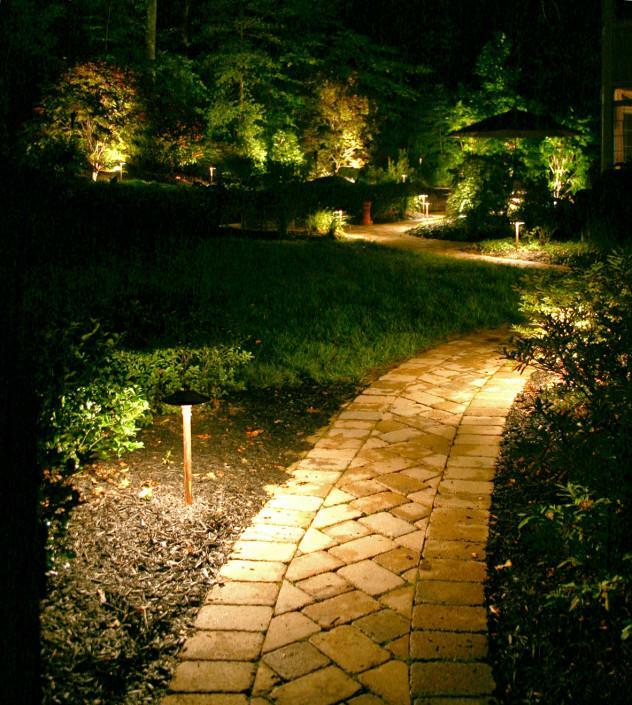 Our design team can configure several landscape lighting designs that will highlight focal points on your property, access points to outdoor spaces and property entrance. 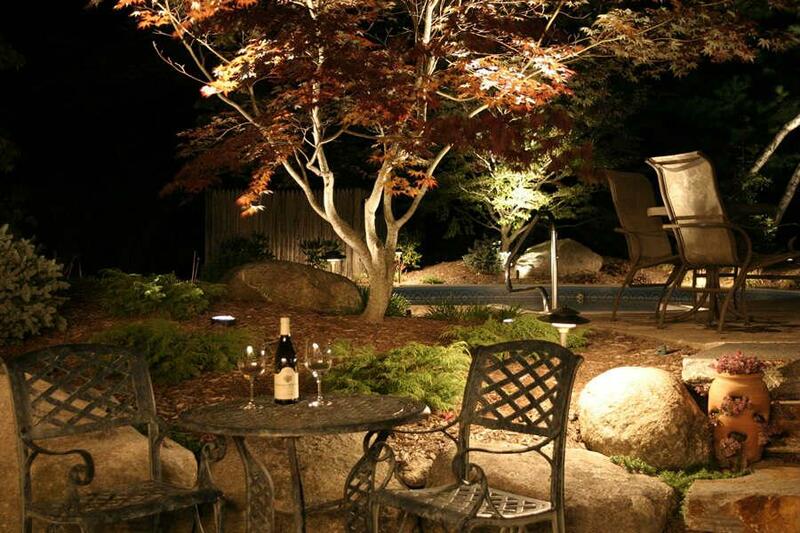 The Patio Company uses a low voltage lighting to create a relaxing ambiance for your landscape at night. Landscaping lights are well hidden safely in the ground near landscape features, such as plants, trees, statues, pillars, and flowers. By angling and hiding the lights it creates a beautiful highlighted look on all of your main features. Not only does outdoor lighting increase the value of your home by increasing its appearance, but it also provides the perfect setting for outdoor parties and events. Host weddings, barbecues, and work celebrations all in the comfort of your backyard. Don’t waste the rest of your day, just because it’s dark outside, relax in your garden lighting with friends and family at night. Exterior Lighting is also beneficial in that it deters possible burglaries by assisting the lighting for security systems and disinterest criminals from wanting to enter a well-lit area. It also provides lite pathways so that you can see where you’re walking if you need to go outside for something as simple as taking the trash out or putting something away in the shed.